25 organisations from across the BSW region signed on to participate in workshops by the Studer Group, focussing on accountability, leadership and process for improving care coordination practice. 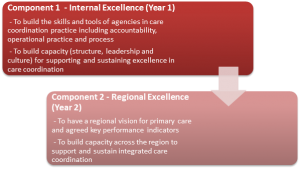 Following the successful “Co-creating goals and indicators for primary care” workshop in July 2014, there is some momentum building around working together as a region to have agreed goals and indicators for care coordination. The Project Working Group is currently working towards a plan for component 2 of the Enhancing Care Coordination project, and primary care agencies from across the BSW will be invited to participate.